There is no cruise control. No power steering. No struts to hold open the hatch that spans the engine and the unreasonably small trunk. There is no cruise control. No power steering. 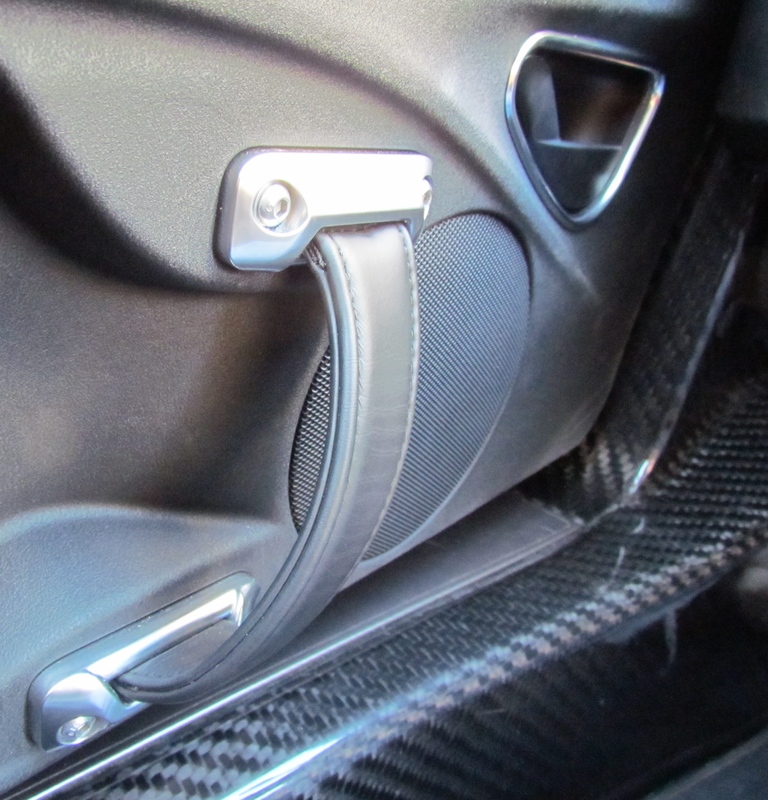 No struts to hold open the hatch that spans the engine and the unreasonably small trunk. No GPS. No push-button starter. No backup camera that might provide at least a helpful hint rather than leave you backing blindly out of a parking place. There are leather straps to pull the doors closed. There also is a wake-the-neighborhood wailing banshee of a sound to alert you that you’ve started the engine but have yet to click the seat and shoulder belt around you, and the turn-signal indicator clacks more loudly than anything Buick might have to alert an elder that the light blinking on the dashboard should be canceled. And there is a sound I hadn’t heard since the glory days of the GTP cars that were racing in the IMSA Camel GT series in its heyday. That sound comes from just over the driver’s left shoulder when you’ve accelerated hard and finally relaxed the pressure on the gas pedal, a wonderful whooshing whistle just like the one that emerged from the waste gates of the P-cars’s turbocharged engines. But while the cockpit is nearly as tight and Spartan, we’re not driving one of those awesome P cars, though the rush of acceleration not only has audible familiarity but is dynamically delightful as well. 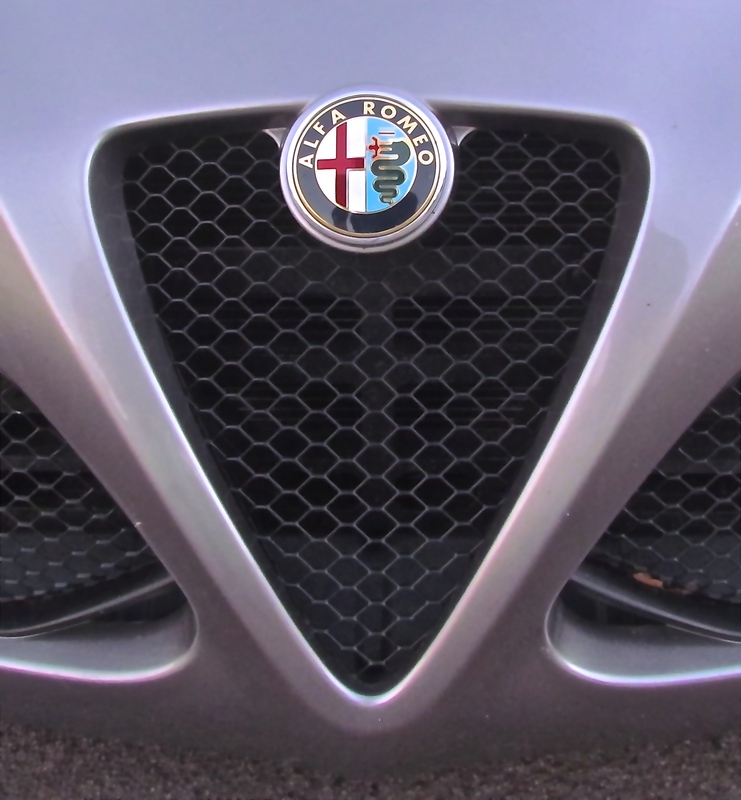 The car we’re driving is the 2015 Alfa Romeo 4C. 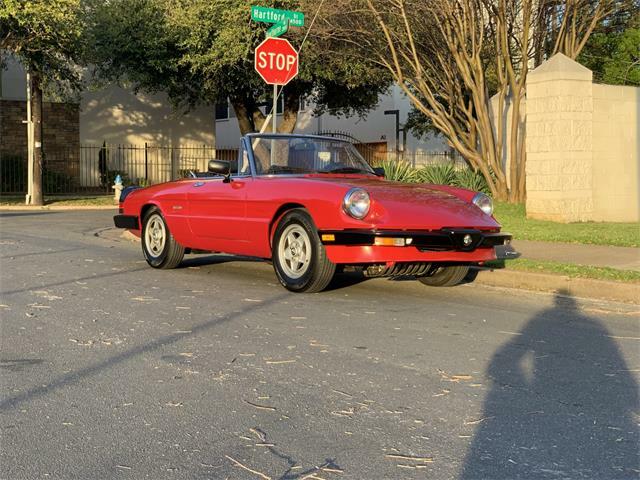 This is a barebones if technologically advanced sports car, probably the kind Colin Chapman might be building today were he just launching Lotus. Chapman, among others, might be surprised the 4C comes with no clutch pedal, but we think it wouldn’t take very many miles for him to appreciate the responsiveness of Alfa’s six-speed, twin-clutch transmission that you can set not only for automatic or manual (via paddles on the steering wheel) shifting, but for weather, natural, dynamic or even race modes. 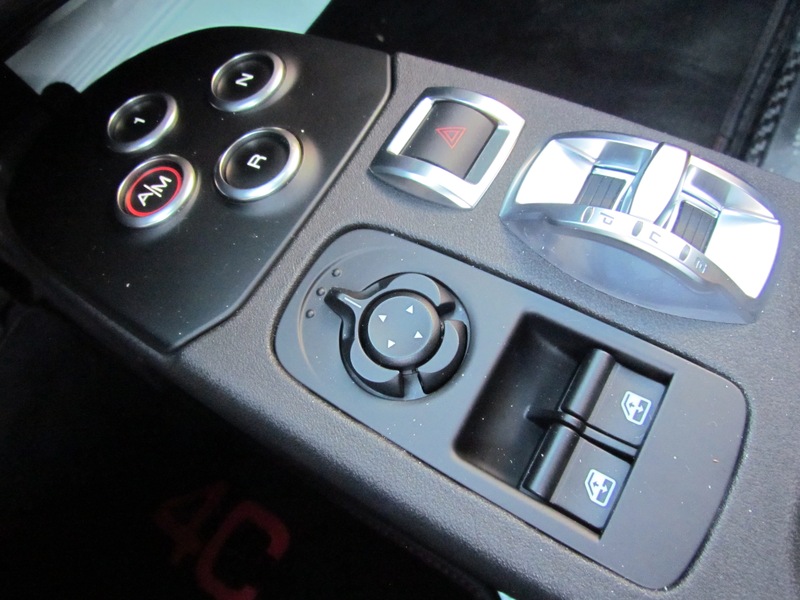 And not only gearbox controls, but chassis-control software also adjusts to those various modes. 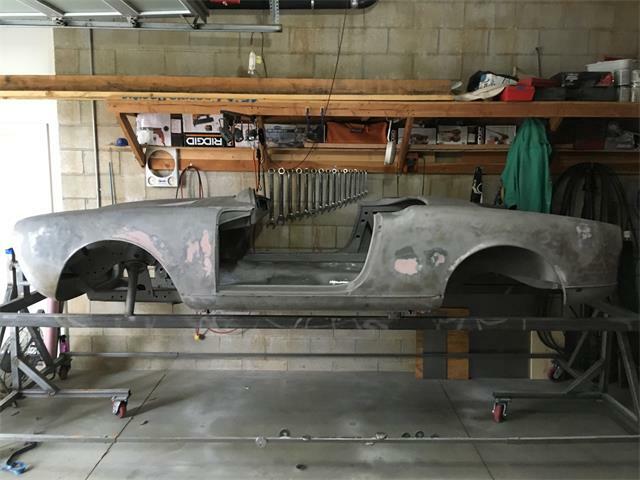 We also think Chapman would appreciate the fact that this car weighs just 2,465 pounds, thanks to a racing-style carbon-fiber monocoque tub between front and rear safety cells, an engine carried on an aluminum subframe, and bodywork made from sheet molding compound (aka fiberglass) composite. Even the weight of the windshield and windows was reduced 15 percent from normal. 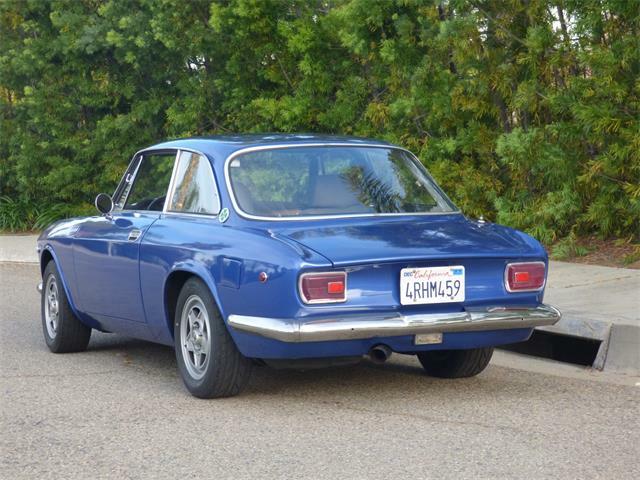 And speaking of that composite bodywork, it is a gorgeously Italian (designed by Alfa Romeo and assembled by Maserati in Modena, no less) exotic design that Alfa says was inspired by the famed Alfa Romeo 33 Stradale racing car penned by Franco Scaglione, though with all sorts of fascias and air ducts, and a rear spoiler to enhance stability and component cooling. 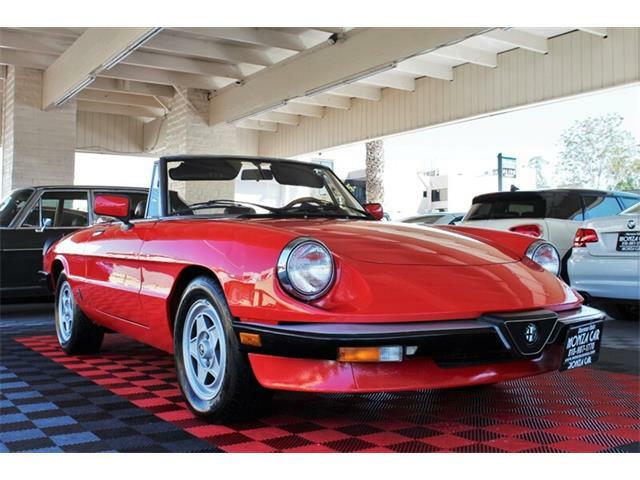 And it’s not just the styling that harkens to Alfa’s history. 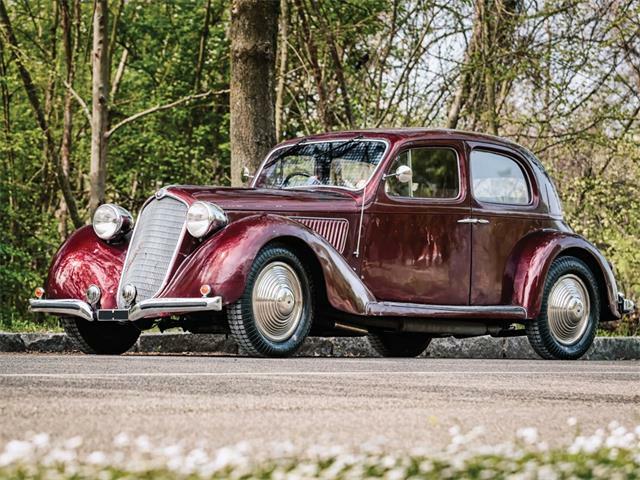 Even the name is derived from the famed 6C and 8C Alfas of the 1930s and ‘40s. Like the 33 Stradale, Alfa says the 4C can reach 160 miles per hour, but unlike the historic racer, the 4C needs less than 5 seconds to zoom from a standing start to 60 mph while it took the 33 Stradale another second to achieve that speed. 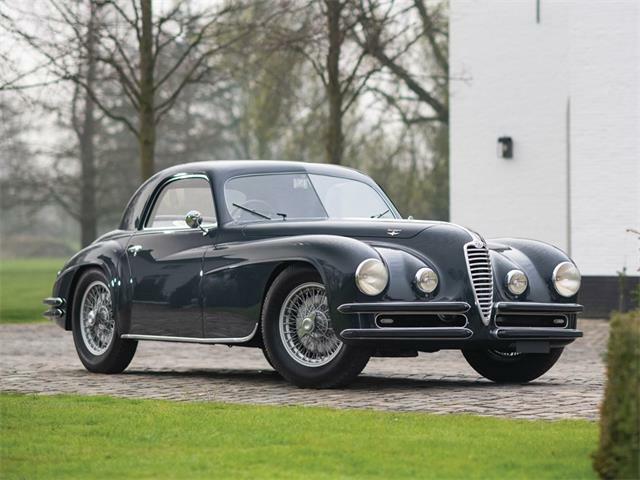 The 33 Stradale carried a 2.0-liter V8 engine that provided 230 horsepower. 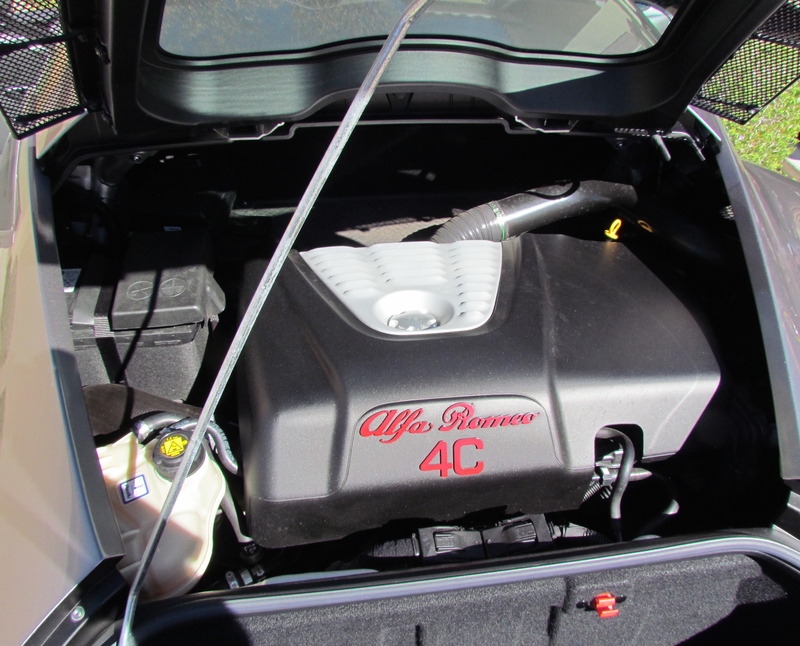 The 4C has a newly created turbocharged 1750-cc four-cylinder engine that pumps out 237 horsepower and a whopping 258 pound-feet of torque, with 80 percent of max torque available at just 1,700 rpm and full power all the way from 2,200 to 4,250 revs. 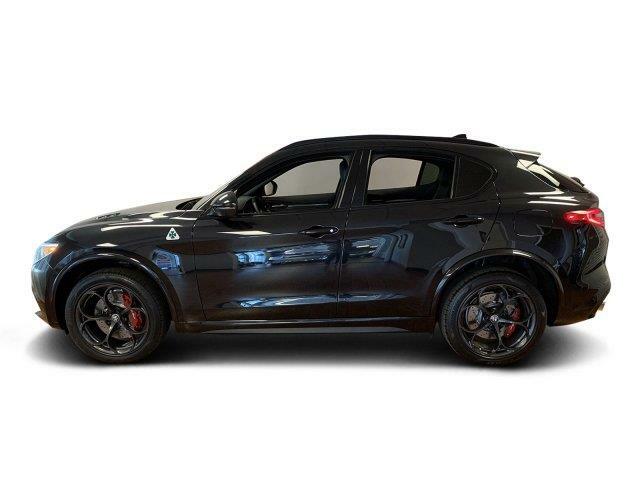 A next-generation turbocharger includes what Alfa calls a “pulse-converter exhaust manifold” designed to “exploid pressure waves and boost torque at low-engine speeds” while a waste gate valve adjusts turbo pressure to improve efficiency. 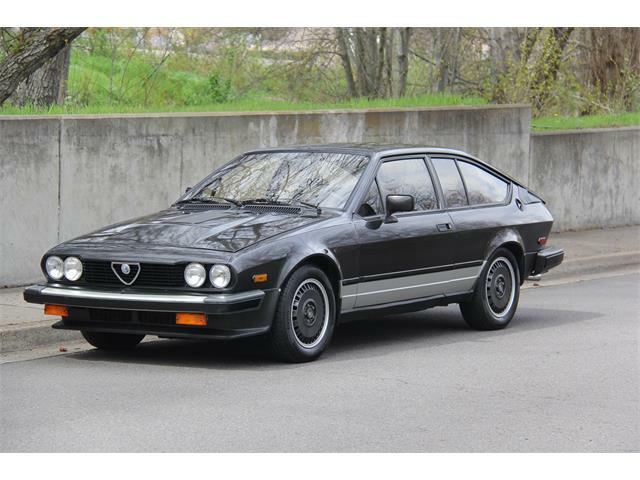 However it’s done, there’s no old-style turbo lag, just instant and more-than-sufficient, thrust-you-back-into-the-seat power whenever you ask for it. 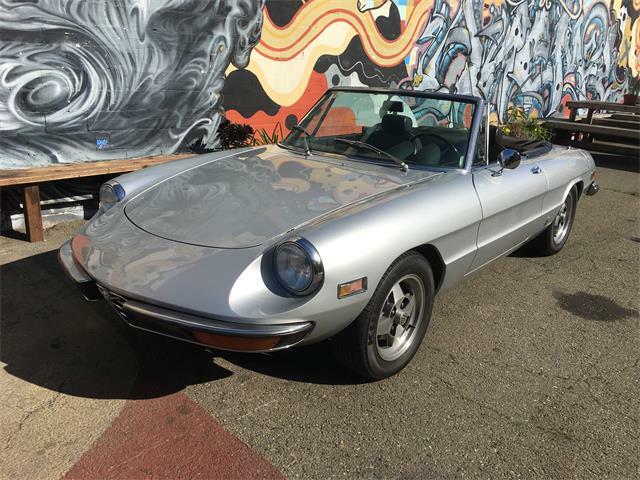 The twin-clutch gearbox responds as quickly as the engine spools up — and likely more quickly than most mortals could do the multi-pedal dance while manually manipulating a gear-shift lever. We were particularly impressed with how responsive and well coordinated the car’s systems — throttle, gearbox, steering, braking and suspension — were as we hustled along a wonderful — and wonderfully empty of traffic — two-lane ribbon of pavement that climbs and dips and twists and turns as it makes its way from the northern edge of the Phoenix metro area out to one of the series of lakes framed by the Mazatzal Mountains. 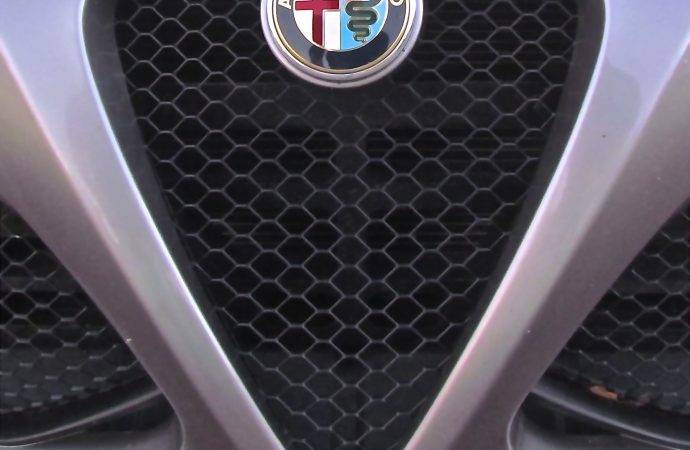 The launch of the 4C marks Alfa’s return to the U.S. automotive marketplace, which it left in the mid-1990s after a 40-year run that spanned, among others, the Giulietta, Spider (of Graduate fame), Sprint, GTV, Milano and 164. We also find the sub-$54K base price a welcome discovery. 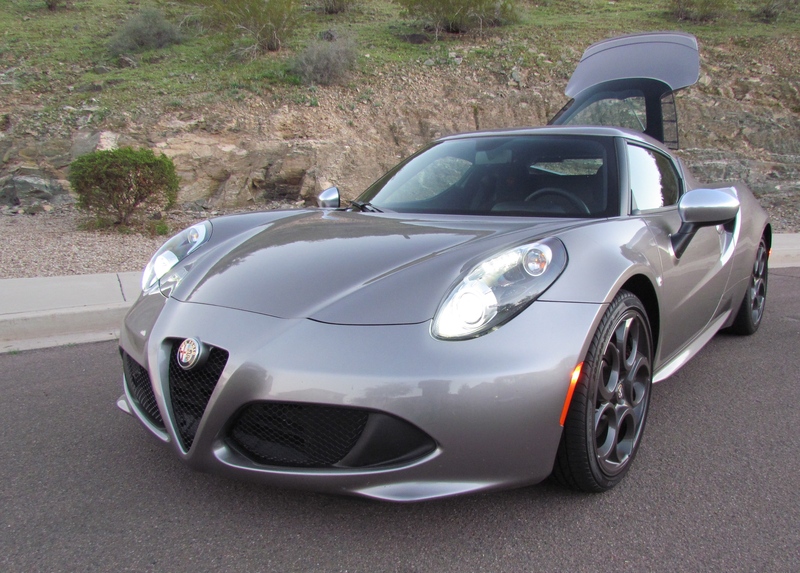 The 4C we tested was equipped with a $500 exterior package, an optional $700 Basalt Gray Metallic paint job, $1,000 Bi-Xenon headlamps, $300 red brake calipers, $2,500 optional forged dark gray wheels, and a $400 car cover, and the Alfa still stickers for less than $61,000, and that includes destination charges of $1,295. Two competitive cars came to mind while we drove: the $63,800 Porsche Cayman S and the $60,000 Chevrolet Corvette Z51. 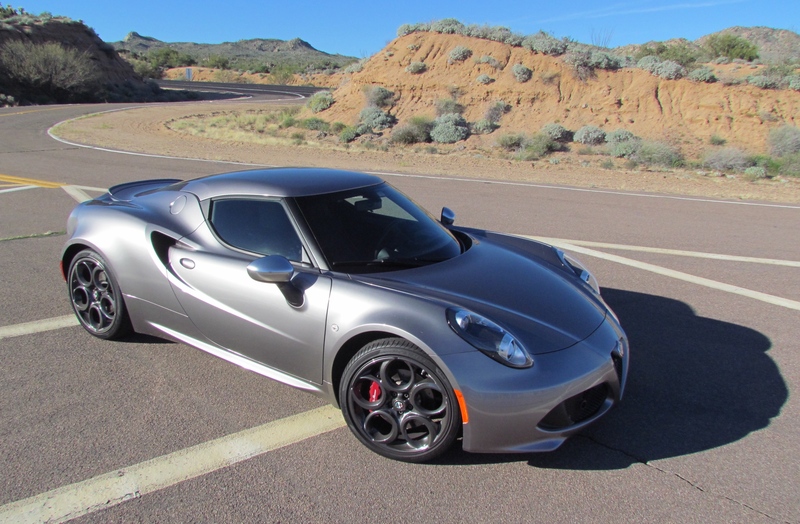 The new 4C is very much a driver’s car: Tight cockpit, small footprint, quick power, amazingly responsive turn-in, great brakes, a “trunk” large enough only for a weekend bag. 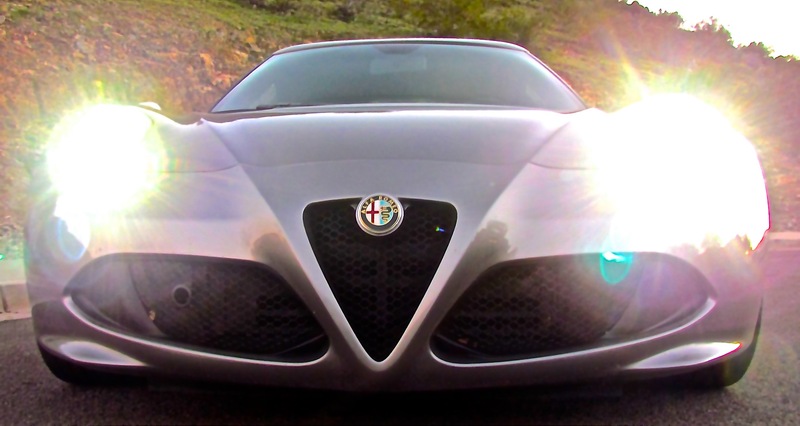 Which means the new 4C is not a car that everyone will enjoy. You pretty much have to fold yourself into the cockpit, and exiting over the very wide door sill is not a graceful event. The engine is right behind the seats and some won’t like its constant aural presence. The cupholders will prove inadequate for many American appetites. 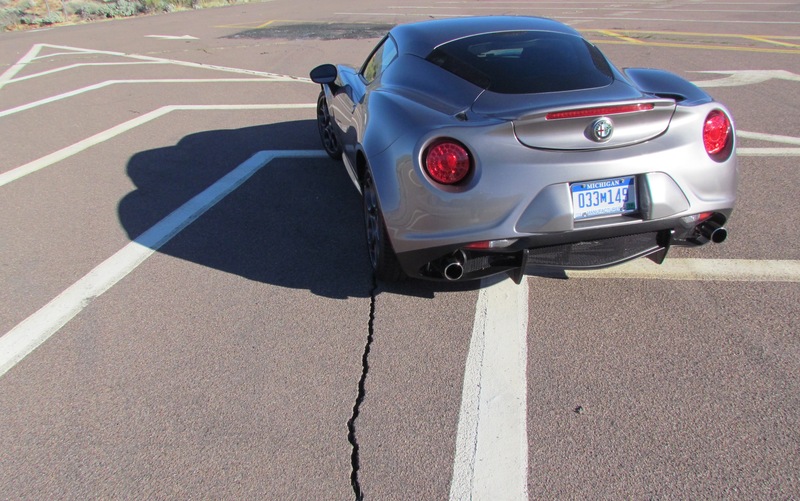 A stiff suspension means you likely won’t want to take this car on a cross-country road trip. A lack of power steering can make parking a challenge. And once you park, there’s no Park gear, just neutral and the hand brake. But even more challenging is backing out of a parking place. Horrendous rearward visibility makes that maneuver a gamble. And yet, for some, this is the ideal car. It can be used for the daily drive to work. In rush-hour traffic, the lack of a clutch pedal makes a huge difference. 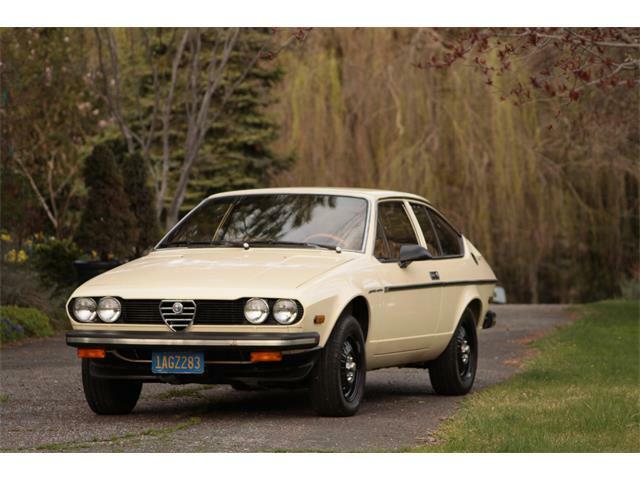 And what a great vehicle for a weekend drive up into the mountains. 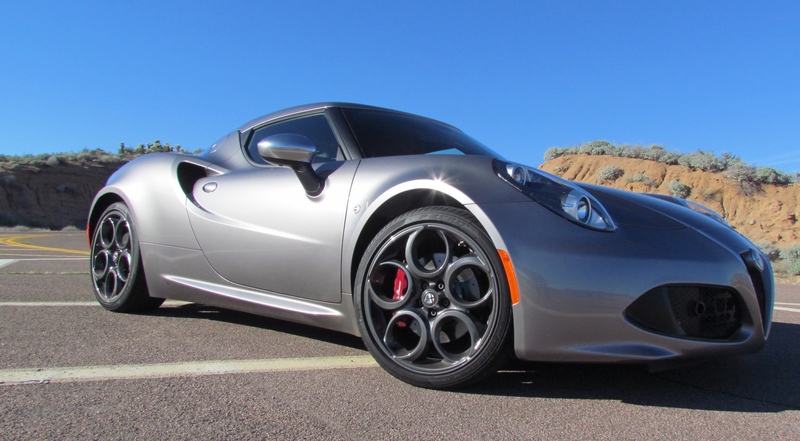 Oh, and if you prefer your weekends at the beach, well, there’s a Spider version of the 4C.